In the distant future, evil robots have overthrown their human enslavers and have travelled through time and space in search of the most powerful fighters! It is up to you to become the ultimate Guardian and slay all those who stand in your way! 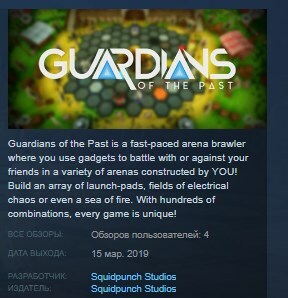 Guardians of the Past is an online and local multiplayer arena brawler with elements of building and strategy! With futuristic weapons and deadly traps, Fight in a multitude of Arenas each with their own unique theme, style and environmental challenge! Take control of a Guardian as you fight against friends online or at home on your couch! Make every game unique and construct unforgiving gauntlets from the vast array of traps and contraptions designed to put you to the test! Want to launch players through the air as they are peppered with arrows and blasted by fire and ice? What about electrifying them while they wade through a sea of tar and poison? 4 Player Online or Local Multiplayer! Take control of your chosen Guardian fighting other players online or at home on your couch to become the ultimate Guardian of the Past! Make every game unique as you and your friends construct gauntlets from a selection of different devices and deadly traps! Play with either controller or mouse and keyboard. The choice is totally up to you! Easy To Learn But Hard To Master! Fast paced mayhem with more explosions than a Michael Bay movie! Master maximum damage combos and skilful plays! New content added all the time ranging from new Arenas and Guardians to Traps and items, guaranteed to keep games intense!